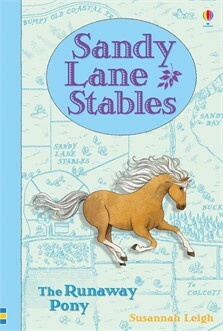 SANDY LANE STABLES is a series of pony books published by Usborne. Sandy Lane is based on East Farm, the riding stables I used to go to as a child. My favourite horse was a 16 hands gentle giant called Jaffa. These exciting stories of friendship and adventure are packed with authentic detail. There are nine titles in this collectible series set in Sandy Lane Stables. I wrote two of the books. Michelle Bates wrote the others. We had a lot of fun working on these stories. Jess Adams has always dreamed of owning her own pony, but of course it's just a dream. She knows her parents could never afford to buy her a horse and so she is content spending every waking moment at Sandy Lane Stables. But one day, the unthinkable happens and it looks as if her dream will come true. Then Jess has to make a terrible decision… which will she choose? Her dream pony or Sandy Lane? When a runaway pony gallops into Sandy Lane, Jess doesn't flinch. Thanks to her quick reactions, the beautiful palomino pony is caught. But the man chasing her isn't all he seems. Soon, Jess is bitterly regretting her moment of heroism. Now my daughter, Daisy enjoys riding just as much as I do!